In keeping with its tradition of hosting colleagues from national Parliaments, the European Parliament's Committee on Foreign Affairs (AFET)invited Members of EU national Parliaments to attend a half-day long interparliamentary committee meeting (ICM) on 2 April 2019 in the morning at the European Parliament in Brussels. The meeting was very well attended with 41MEPs and 25 MPs from 19 national Parliaments from Austria, Bulgaria, Croatia, Czechia, France, Germany, Greece, Hungary, Ireland, Italy, Latvia, Lithuania, Luxembourg, Poland (both Chambers), Portugal, Romania (both Chambers), Slovenia, Spain and the UK. Following the opening remarks of Mr David McAllister, Chair of the Foreign Affairs Committee, an exchange of views was held on the future of the Common Foreign and Security Policy (CFSP) including a debate on the last AFET annual report on the CFSP. The main items discussed were the challenges the EU faces nowadays, the positions of Members States towards qualified majority voting in the Council on CFSP and the EU's need to focus on displaying a stronger leadership in terms of foreign security policy. Moreover, the interventions also focused on topics as how illegal immigration affects the different EU Member States, the importance of keeping the UK close to CFSP in the future and on the EU-NATO cooperation. The second panel of the ICM was organized on the EU's future relations with the UK after Brexit, with the participation of EU Chief Negotiator, Mr Michel Barnier. He stated: "I trust we can complete these Brexit negotiations in a positive way, in order for the EU to square up to the numerous challenges that are becoming even more serious for us: climate change, the economy, technological warfare, migration and European defence." In the third panel the way forward for the European Neighbourhood Policy(ENP) and Enlargement Policy was debated with European Commissioner for Enlargement and European Neighbourhood Policy, Mr Johannes Hahn. The main topic discussed were the EU accession of the Western Balkans in order to export stability and foster reforms. The Commissioner also emphasised the importance of the existence of rule of law at both international and national level. The first-ever female President of the Republic of Croatia, Ms Kolinda Grabar-Kitarović, issued the keynote speech calling women's rights one of her primary responsibilities. She told the audience she had to break countless glass ceilings often at personal cost. She considered the so-called cultural arguments as an excuse for not giving women rights unacceptable. Her conclusion was a message to all girls and women, saying, "Have faith and believe in yourself; in your values your strength, your knowledge and capabilities. Your determination will make all remaining obstacles fall." 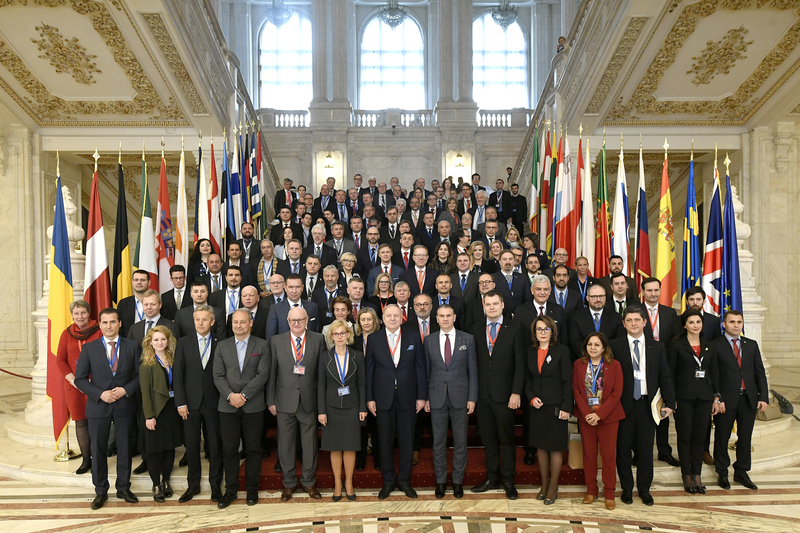 120 parliamentarians from the national parliaments from 27EU Member States and the European Parliament came together in Bucharest on 7and 8 March 2019 for the 14th Inter-Parliamentary Conference for the Common Foreign and Security Policy and the Common Security and Defence Policy. Just a few months before the European elections, they discussed current foreign and security policy challenges, such as the security of the Black Sea region, the EU's relations with its eastern neighbours and the future of EU foreign policy after Brexit. The meeting took place in the context of the parliamentary dimension of the Romanian presidency of the Council and was organised jointly by the Romanian Parliament and the European Parliament. A "European Women's Deputy Declaration" was adopted by female parliamentarians in the margins of the IPC and presented in the plenary on the occasion of the International Women's Day on 8 March. 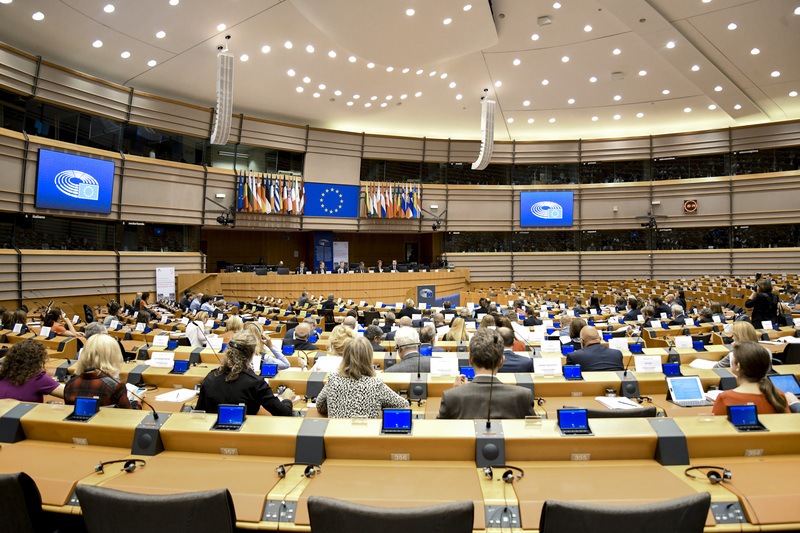 In the context of the economic and budgetary policies scrutiny, the European Parliament together with the Romanian Presidency organised the European Parliamentary Week2019, on 18 and 19 February 2019, at the European Parliament in Brussels. The conference brought together 128 Parliamentarians from 27 Member States, 5 candidate countries and Norway and Switzerland to discuss economic, budgetary and social matters. Itconsisted of the European Semester Conference and the Interparliamentary Conference on Stability, Economic Coordination and Governance in the European Union. This was the eighth edition of this event and the last one for this legislature. The 4th Meeting of the Joint Parliamentary Scrutiny Group on Europol (JPSG) took place on 24-25 February 2019, in Bucharest, Romania, in the framework of the parliamentary dimension of the Romanian Presidency of the Council of the EU. Reporting on recent activities of Europol and of its Management Board featured high on the agenda of the meeting. These items were complemented by an address by Sir Julian King, Commissioner for the Security Union, reporting from the European Data Protection Supervisor and by exchanges of views on the Europol Travel Intelligence Centre (ETIC) and the European Cybercrime Centre (EC3). Here you can read more articles from previous events.